A new visual identity as part of the ongoing evolution of this firm has been launched by the former Euroconsult company — their new identity is Euroconsult Group which encompasses Euroconsult and Satconsult. Since the firm's incorporation more than years ago, Euroconsult has grown into an internationally renowned group dedicated to providing private companies and governments with high quality decision making tools. 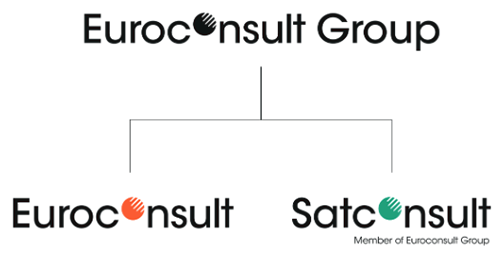 Following an international expansion into Asia and North America and the acquisition of a majority share of the engineering consultancy, Satconsult, in 2016, the Group now offers a full suite of services to clients all over the world. Today, the Group helps clients make informed decisions through the firm's data analysis and strategic and technical know-how.The company also actively supports their clients in the design and implementation of new projects and systems. The company decided the time was correct to update their visual identity to better communicate who the firm is today and to embody the mutual values and capabilities of the Group.